Funeral for Shirley M. Scott will be at 3:30 p.m. Monday, Dec. 21, 2015, in Becker-Rabon Funeral Home Chapel with Dr. Greg Baxter, chaplain, Promise Care Hospice, officiating. Shirley M. Scott, 85, of Lawton, passed away Thursday, Dec. 17, 2015, in Lawton. She was born May 18, 1930, in Pueblo, Colo., to Harvey F. and Mary Marie Hancock Carter. She married Leslie B. Scott on June 10, 1948, in Kobe, Japan. He died Feb. 7, 2014. Mrs. Scott was a homemaker. She had a love for family and travel. 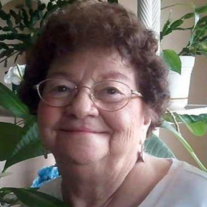 She was a charter member of Lawton Heights United Methodist Church, had served as a leader for the Girl Scouts and Camp Fire Girls and was active in the Civil Air Patrol. She was a member of Koffee Kup Bowling League, and was a longtime member of Heartline HCE. Mrs. Scott was also a homeroom mother at Swinney School for several years. Survivors include three daughters: Eva M. Hennessee, Lawton; Pamela K. Adams and her husband Ron, Peachtree City, Ga.; and Julie A. Parmley and her husband Dennis, Milledgeville, Ga.; a son, Leslie B. Scott Jr. and his wife Crystal, Las Cruces, N.M.; nine grandchildren; 13 great-grandchildren; and two great-great-grandchildren. The family would like to give a special thanks to their extended family at Promise Care Hospice and Ten Oaks.